Originally designed for cleaning eye surgical instruments, the ONEcleaner enzyme surgical instrument cleaners render residue free surgical instruments. 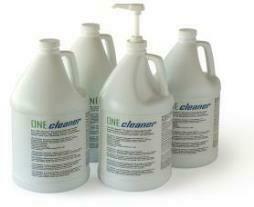 The ONEcleaner Enzyme Detergent Cleaners lubricate while they clean. deliver the 4 enzyme detergents that are necessary to effectively breakdown and remove bioburden from surgical instruments. Surgical instrument detergent enzyme cleaners that do not contain these four enzyme detergents cannot remove all forms of surgical bioburden. The ONEcleaner enzyme surgical instrument detergent cleaners are the most effective enzyme surgical instrument cleaners available. The ONEcleaner enzymatic surgical instrument cleaners clean faster with lower cleaning process costs. The ONEcleaner surgical instrument detergents clean more effectively and lubricate while they improve the cleaning process outcomes.